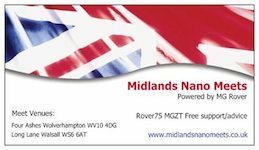 Forums » Technical Help for Rover 75 and MG ZT » 75 and ZT Technical help for all derivatives » Water stains on Tourer load cover. Related topics: Tourer load cover, Tourer Load Space, will a, Tourer water ingress, Water in spare wheel well of tourer, Tourer loadspace cover and net. I have experienced water stains on the (extended) load cover of my Tourer. Does anyone have any suggestions on where the water could be coming from and the remedy to prevent a reoccurrence? I am also experiencing the accumulation of water in the spare wheel well, but I see this is more than adequately covered in the Know How Listing. May I take this opportunity to say that the Know How Listing is a marvellous resource of information, and is a credit to those who have compiled / contributed to the listing. Rover418275 wrote: I have experienced water stains on the (extended) load cover of my Tourer. What about this as a solution, take out windows and replace seals with new ones? Water in the boot on mine was the sunroof drain tube had come apart on the drivers side , you may not have a sunroof but a bit of trim stripping to get to get into the drains beside wheel arch . Drips on the load cover on mine were coming from rear window wash as it wasn't sealed properly at the nozzle on rear window . I don't think it is the rear windows that are leaking. The water stains are inward of the load cover and forward of the handle. This leads me to believe that the leak is from the window of the tailgate. You comments etc would be most appreciated. lm having the same problem,water stains roughly in the middle of the cover.this only happens when it rains,so lve just been outside for 10min with the hose and found no trace of any water getting past the seals.it doesnt look like l will have too long to wait for some rain so l can sit in the car and find it. I had a very similar experience with mine. The cure was to run a thin run of clear silicone seal all along the top only between the top of the rear opening window and where it closes on the rubber seal, since then, no more water coming in, great! I think this point is a weak spot on the Tourer's. I get this sometimes too. It happens both sides, and if I play with the seating of the seal on the body, it stops for a while. It looks like the water sits in the channel above the tailgate and seeps through that seal. As you will be aware if you have been in the Manchester area today, it absolutely poured buckets today. Hi mate, try using some silicon based cleaner / wax on the rubber before replacing it...it usually works..
That's exactly where mine seems to be. Play with the seals a bit and it's OK for a while, then starts again. Must try the silicon / lubricant trick myself. Rover418275 wrote: As you will be aware if you have been in the Manchester area today, it absolutely poured buckets today. Mike, it's the same with mine. It stays dry during rainy days, but some drops of water come in when I use a car wash. There are small traces of lime at the upper break light, so it can't be rain water. well,no amount of cleaning or adjusting would stop my seal leaking.l ordered a new one from rimmers Ã‚Â£42 delivered and thats done the trick. Good news, have ordered one myself too. The correct solution to this problem does appear to be the seal of the tailgate, not the tailgate window. A few weeks ago the water stains reappeared on the load cover and I discovered a droplet of water coming from the interior trim adjacent to the tailgate seal. This droplet of water has only one way to go, and that is on to the load cover. So it would appear that if you have water stains on your loadcover, it is due to a leaking tailgate seal and not the tailgate window. Water stains on Tourer load cover.